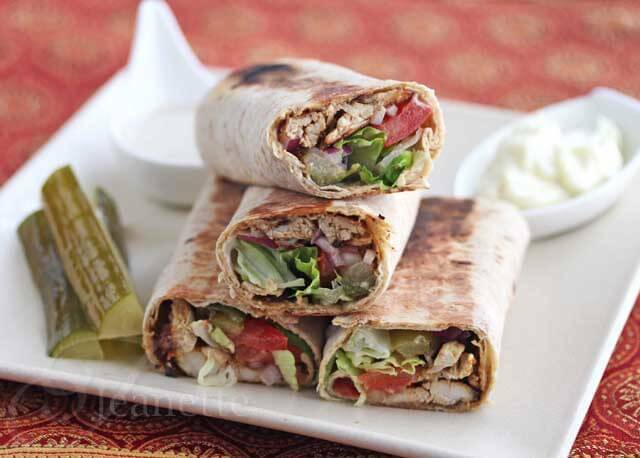 Shawarma Chicken Wraps are flavorful and fun to eat. This recipe makes it possible to recreate a popular street food in your home kitchen. 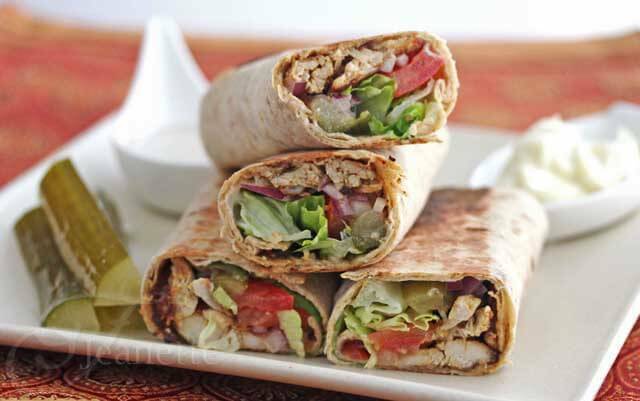 I’ve been making these Shawarma Chicken Wraps for the past eight years, and my kids love them. 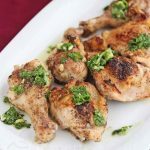 They’re packed with flavor (the garlic mayonnaise compliments the spiced chicken perfectly), and look like a burrito or taco so it’s a great way to introduce something new to your family. 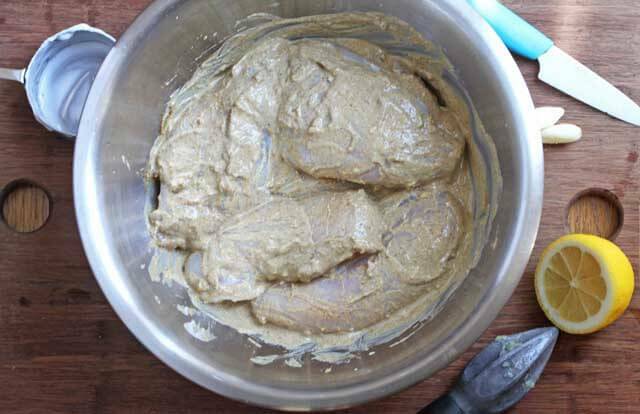 Have you ever heard of Shawarma chicken? 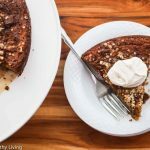 I started exploring Middle Eastern cooking in 2012 when I discovered Faith Gorsky’s cookbook, An Edible Mosaic. The first recipes I tried were Shawarma chicken and her Zucchini Fritters). Faith’s cookbook provides so many little tips and tricks that are incredibly helpful, including how to duplicate the crispy pieces of Chicken Shawarma that you might get at one of the little shops in the Middle East that specialize in this sandwich. I watched a few videos and read several blog posts about Shawarma and it seems there is almost a cult-like following. In fact, people seek out the very best Shawarma shops and do their own taste testing. Faith says that in populated areas you might see half a dozen Shawarma vendors within a few blocks. The spices in Shawarma are almost curry-like, comprised of a laundry list of aromatic spices – cumin, coriander, cardamon, ginger, allspice, fenugreek, cloves, paprika, turmeric, cayenne and black pepper. I actually had all these spices (you should see my spice drawer!) in either whole or ground form, so I was able to recreate the recipe from An Edible Mosaic exactly as written. Shawarma is eaten in Arab countries, Israel, Mexico (introduced by Middle-Eastern immigrants), Pakistan, South Africa and the United Kingdom, and the meats, toppings and sauce vary depending on the country. Traditionally, Shawarma is made with chicken, lamb, beef, or goat that has been marinated, and is wrapped and cooked on a vertical rotisserie (similar to Greek gyro meat). When an order is placed, meat is shaved off and served as a wrapped sandwich (using pita bread or Lavash flatbread) with fresh vegetables (cucumbers, tomato, lettuce, onions), pickles and a sauce or two (a garlic sauce called Toumieh and sometimes Sesame Sauce). I wanted to make a Chicken Shawarma as authentic as possible, so I made the Cucumber Pickles a week ago, marinated the chicken overnight, and made a batch of Garlic Mayonnaise (highly recommended by Faith) as well as Sesame Sauce. 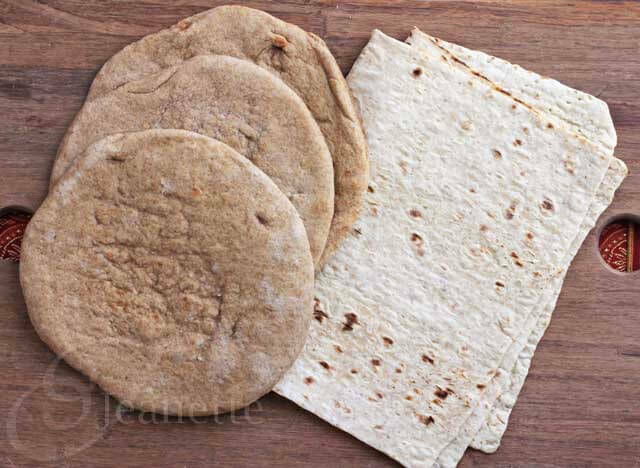 Finding the proper bread proved to be easier than I thought – our local Greek store had whole wheat pocketless pita and I found oat bran/whole wheat lavash flatbread in the deli section of a supermarket. 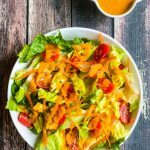 Although this sandwich is considered fast food in the Middle East, it does require some preparation of all the different components, but it is well worth the effort. Faith uses a clever trick to replicate the crispy chicken pieces of an authentic Shawarma. 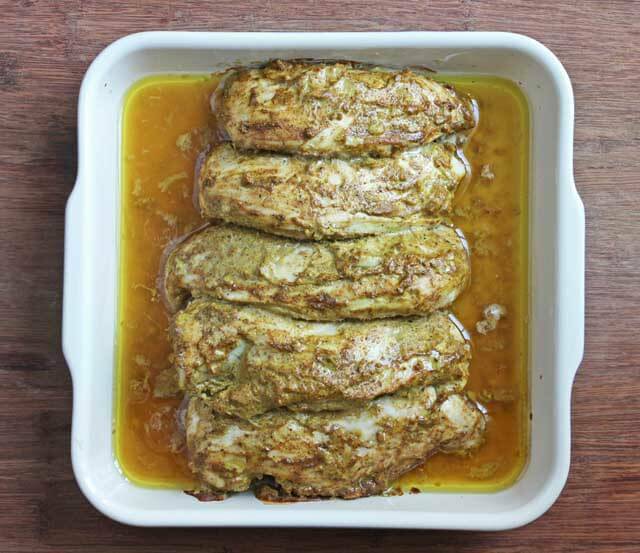 After marinating the chicken overnight in lots of spices and yogurt, the chicken is cooked twice – first baked, then sauteed. This extra step makes the chicken chewier and crispy, and results in authentic-tasting shawarma according to Faith. I actually used four different wrappers for my Shawarma – Lavash Flatbread made with Whole Wheat and Oatbran (which was the easiest to roll up), Whole Wheat Pocketless Pita Bread (I found this at our local Greek market), Corn Tortillas (for a gluten-free version), and Collard Wraps (I got collards in my CSA Box and have been wanting to try them as a wrapper). For toppings, I chose fresh tomato, lettuce, onions and Cucumber Pickles. The boys really loved these Shawarma Wraps – and Faith was right, the Garlic Mayonnaise definitely made the sandwich. Personally, I liked the garlicky Sesame Sauce and have been slathering it on just about anything I can think of. I’m starting to wonder if I smell like garlic everywhere I go. These Shawarma Wraps were so good, I wish our fast food joints sold something this tasty. 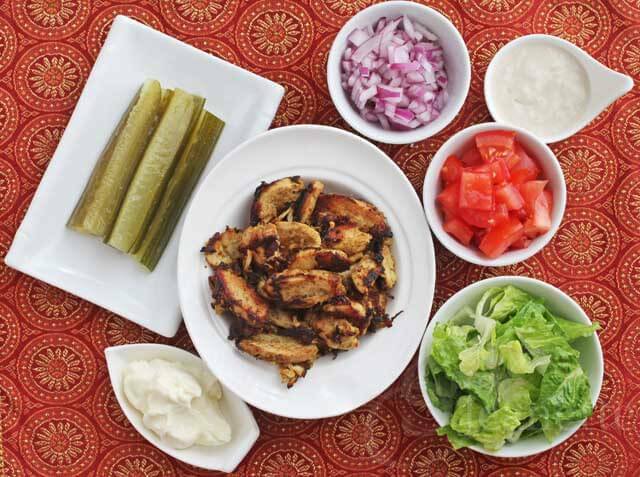 I highly recommend doubling the recipe for this Shawarma Chicken and using it for your weekly meal prep – delicious! I included a small container of the garlic mayonnaise (cheat: mash garlic with salt and mix with mayonnaise), and included a simple cucumber tomato salad with crumbled feta, and pita bread). This dish is not hard to make, it just requires a little bit of planning ahead. Well worth the effort! Ten times? I don’t think I can 🙂 This looks really freakin’ good! I’m sure Eric would love this! Those look delicious, Jeanette! Seems like you are having a great time with that cookbook. I was really looking forward to these, as well…and they did not disappoint! Love all your wrapper variations…I’d be happy eating any one of them. Yours turned out beautifully! 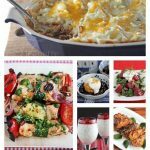 Faith – another great recipe from your upcoming cookbook! These were so good, truly. I am having so much fun learning more about Middle Eastern Cuisine. You had me at Garlic Mayonnaise. Or maybe it was at Chicken Shawarma. Oh, no, wait! It was at the picture of all those beautiful spices. Whatever it was, I can’t wait to try this! Heavenly! I just love all those spices!! 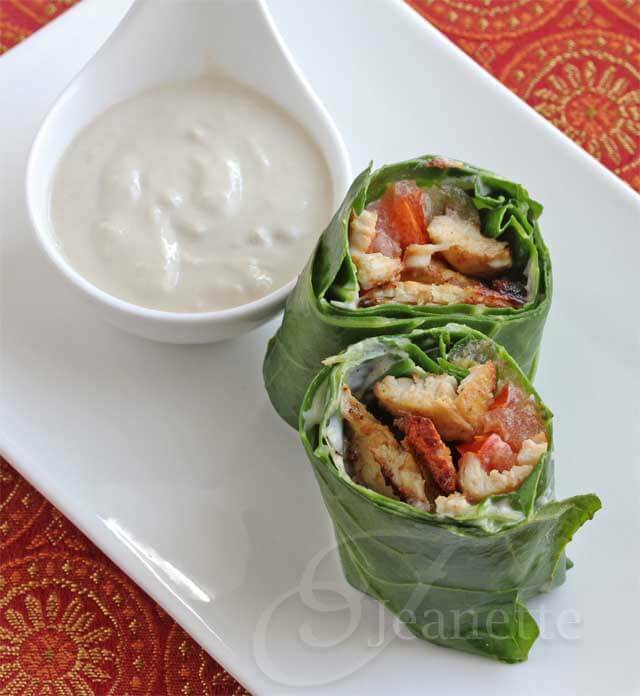 So glad you all are liking these Sharwarma Chicken Wraps as much as I do! Can’t wait to make these again for my family – would make a fun entertaining idea too. I can’t wait to try these. Would make a great party food. These look so delicious. 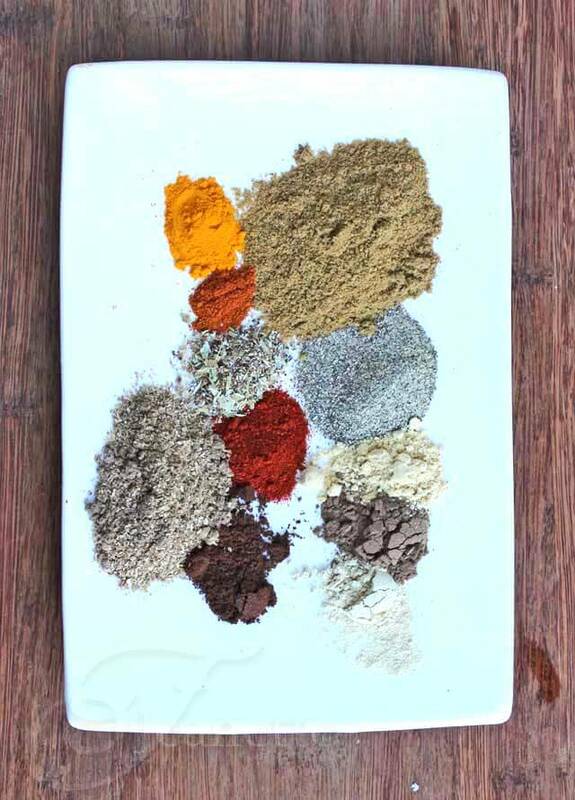 What a gorgeous collection of ingredients and aromatic spices. I’m a big fan of Shawarma (and especially the pickled turnip that typically accompanies them – in these parts anyway – but that’s another obsession story ;-)). Wonderful job Jeanette! I get so frustrated by international snack food/fast food that turns out to be so involved. 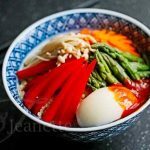 This at least makes a good meal, but some dishes that you really want to try making do not make any kind of nutritional contribution to your meals and you are left trying to decide if they are worth the effort…. I made a tofu version of these this weekend and LOVED them! The spice mix was just perfect in so many ways. So glad your wraps turned out just as deliciously! I love Middle Eastern food, but I’ve never had shawarma. I might have to try making these with tofu like the commenter above! Yum! These wraps look incredible! This looks absolutely wonderful! I’m not a pickle person, so I probably wouldn’t make those. But I’d definitely try everything else! I can’t wait to get my spice on. That plate of delicious spices is ridiculously enticing. Something to try one this weekend. 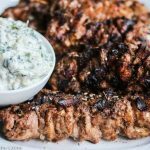 Super yummy and I bet that my friends will love this if I make a batch of these mouth watering shawarma for them. 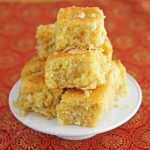 Larisa – I am making a double batch next week, one for my family and another to share with friends – it is so good! I love how much you stuffed into yours. I seriously cannot wait to make these again. They were SO good!! I was planning to buy a small rotesserie for the home, to get the perfect shawarma. Any idea how the meat is fixed onto the rotesseire ? Hi Vincent – sorry I don’t know how to place the chicken on the rotisserie. You might ask Faith over at An Edible Mosaic (this recipe was from her cookbook). I just had shawarma for first time recently and now I’m obsessed. I was just asking a friend for the recipe today! What’s also funny is the place I had shawarma they recommended a special house pickle and garlic mayo with it. This looks so perfect Jeanette! 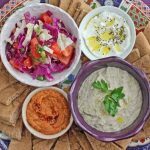 Aggie – the first time I made shawarma was for Faith’s cookbook review – it was so good and I have been obsessed ever since! 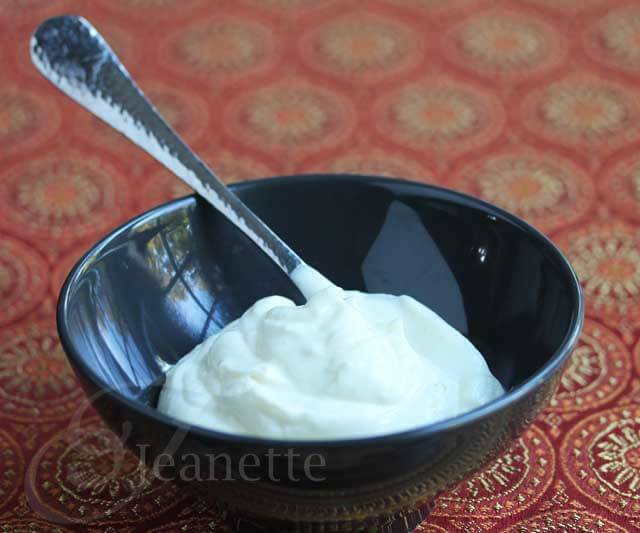 Perhaps the oil was added too quickly – you have to add it very very slowly so it emulsifies. They look very delicious, I love esp. the idea of using collard to make them low carbs. 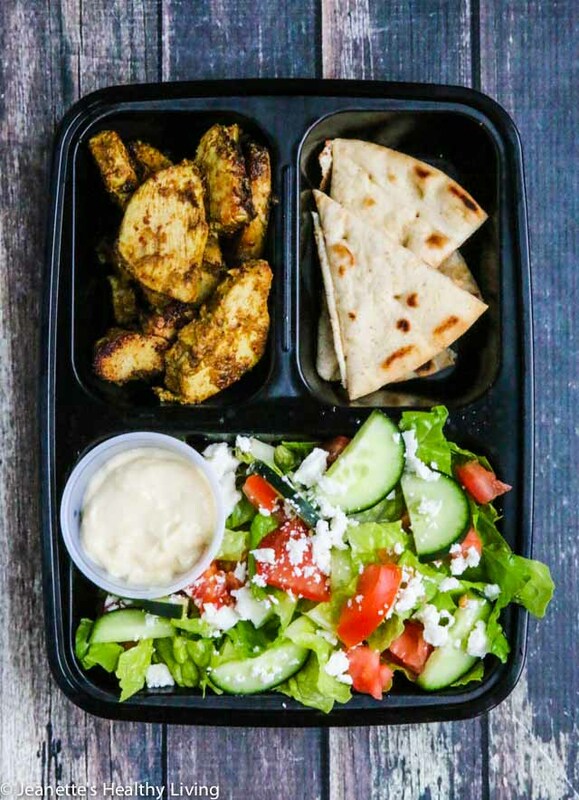 We love the idea of delicious chicken shawarma all packaged up in a neat wrap, with cool, crisp vegetables to polish it off. Can’t wait to give this a try. Looks absolutely delicious.